Many of us get a good feeling from planting seeds and watching them grow when outside it is still dark and cold. But inside, we are planning for spring planting. We can start the varieties we want—perhaps a favorite is not available locally as a transplant or as seed; we can raise it ourselves from seed! Most everyone I know has good luck starting seeds in a sterilized seedling mix. It may be difficult to find an organic seedling mix; and it must be sterile or seedlings might dampen off from fungi present in the air and abundant in unpasteurized soil mixes. A mix I make is soil free: 6 parts sterile (pasteurized)peat moss + 3 parts fine perlite + 1 part washed coarse sand. If you are unsure if your mixture is sterile or not the mix may be heated in an oven at 160 degrees for one hour. Do not allow the mix to heat above 180 degrees. 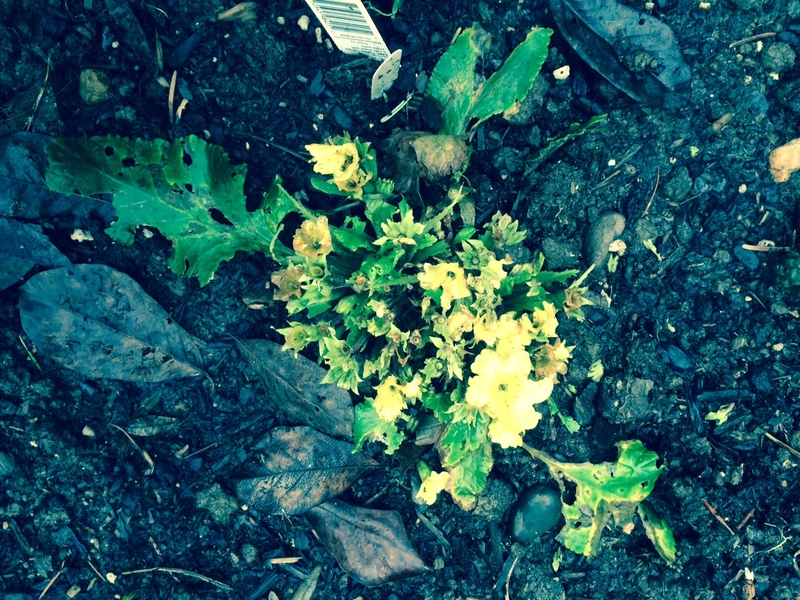 A mixture including compost would need to be sterilized by heating to use for seedlings. Several types of containers might be used to start your seedlings. In the first picture above, I used a milk carton cut laterally, providing two useful containers. Shown are pepper seedlings. Peat pots work well for plants that are difficult to transplant, because they minimize transplant shock and biodegrade into the soil. Be sure to keep them quite moist once planted, because if the peat pots become too dry, roots will not penetrate the container. Some plants that benefit from being raised in peat pots and are difficult to transplant are: portulaca, nasturtiums, sunflowers, poppies, eggplant, squash, cucumbers, melons and pumpkins. Peat pellets also work, but they sometimes are so hard that roots have difficulty growing in them. 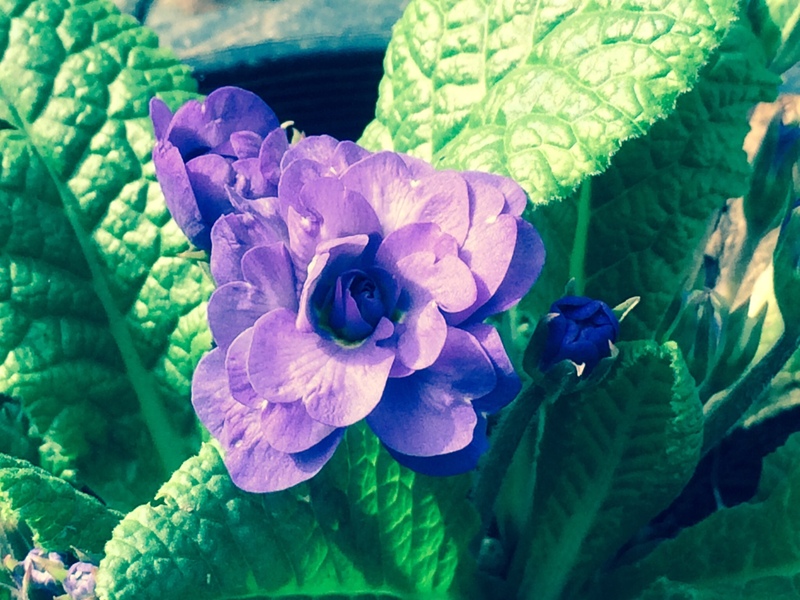 In January plant impatiens, begonias, geraniums and salvias. Late January or early February is a good time to start eggplant, peppers, onions, petunias and pansies. March is probably the best month to start cole crops (brassica family). April is a good time to start tomatoes and balsam; late April or early May for pumpkins, squash, melons, cucumbers, and nasturtiums. Florescent grow lights with an adjustable chain are a great help in starting nice seedlings; the lights can be lowered with the chain to keep the newly emerged seedlings in bright light. This will prevent your plants from getting “leggy”. Temperatures vary for germination: cole crops about 65 degrees, onions about 70, tomatoes about 75 and eggplant, peppers, squash, melons, cucumbers and nasturtiums about 80 degrees. Make sure your seedling mix is not too wet. 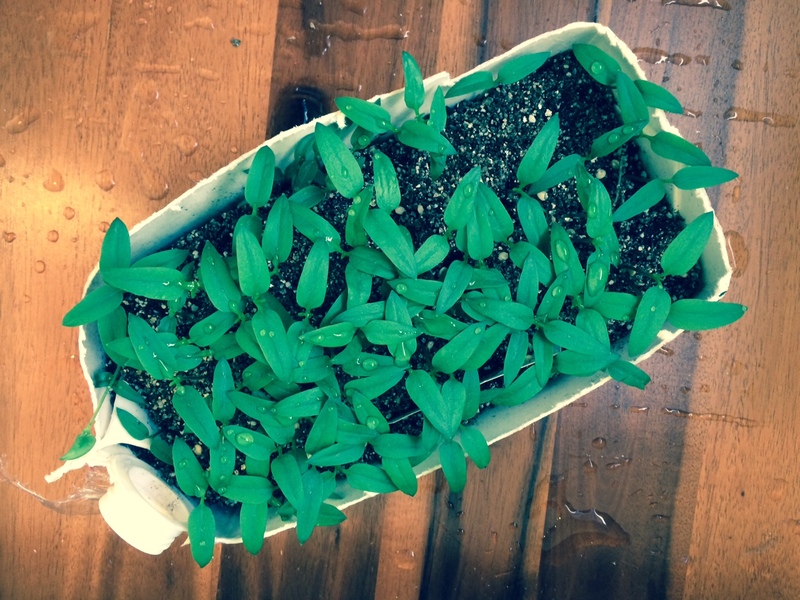 Some seeds like to germinate on the dry side, such as tomatoes and peppers. I cover my newly-planted seeds with plastic wrap, but check them twice daily for moisture and rotate them if necessary. Once the seeds are just up, I loosen the wrap (a little more each day) to harden the babies off to the air. Grow your plants on in cooler conditions than you germinated them and they will grow stockier. 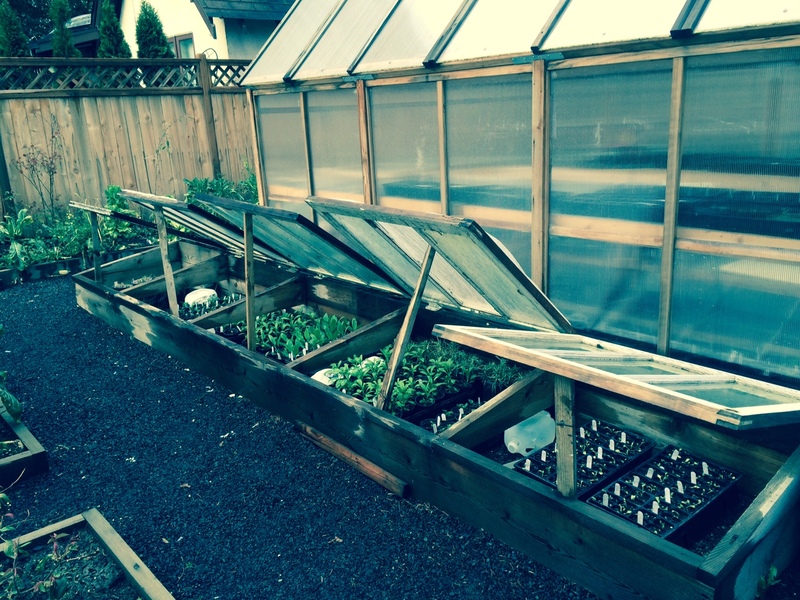 A cold frame is just about the best place you can put them if it is not too cold outside. In a south-facing cold frame the soil will remain warm at night, and daytime venting will give the plants fresh air. Keep shade cloth handy if it tends to get too hot during the day in your area. This is a common occurrence in dry, sunny climates with warm days and frosty nights. 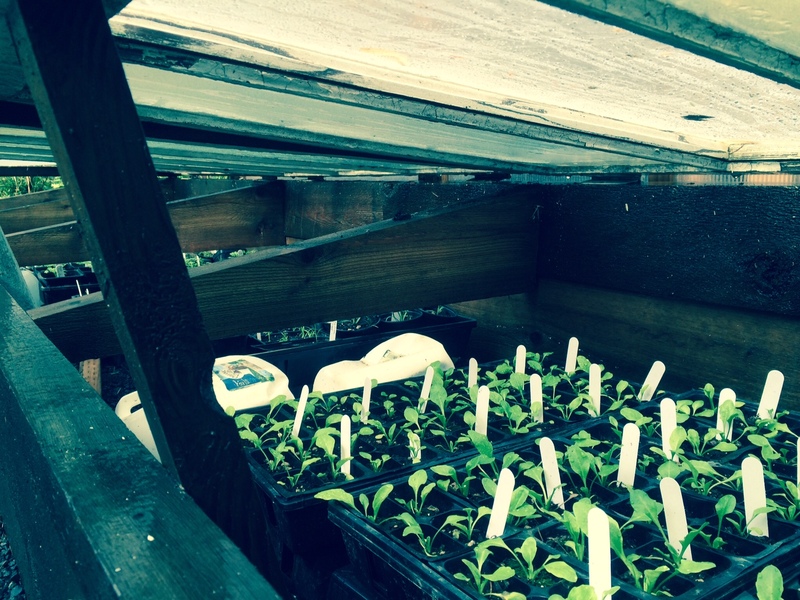 The second picture above shows newly transplanted seedlings in a cold frame vented for the day. A cold frame will harden-off your plants before planting out. Don’t forget to place open-ended containers around plants as you place them in the garden to deter cutworms. Good luck! In my organic garden of heirloom plants here in Oregon, we have several pests: deer, raccoons, dogs, squirrels, rats, slugs, cabbage looper larvae and cutworms. Cutworms have been the most consistently damaging of the group. Typically, they sever the stems of young transplants, a preferred food of theirs. They also eat most of the plants I grow; all vegetables, but especially plants of the Brassica, Dianthus, Primula and Viola families. Here, they are a year-round pest, perhaps because of the mild weather of the region. Cutworms belong to the family Noctuidae. 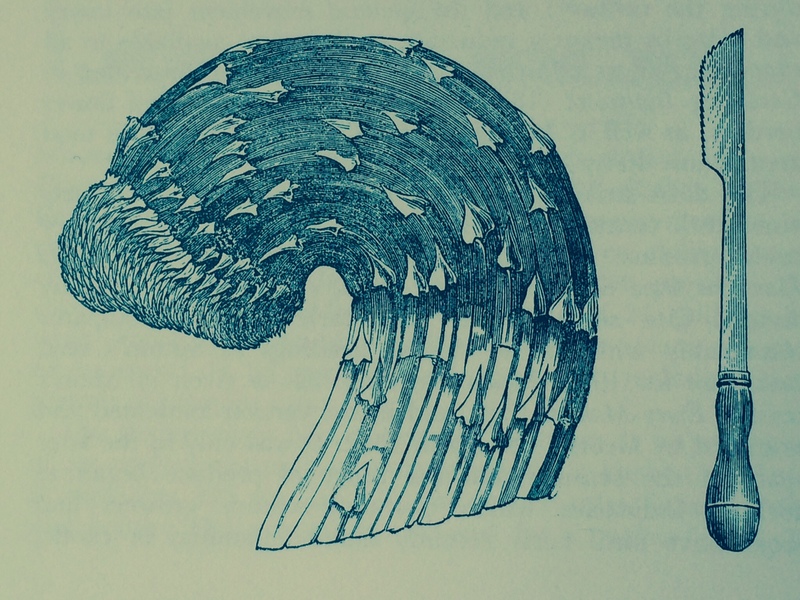 Note that the Latin root word here “noctu” refers to night—the time when these insects feed. They come out about two hours after dark to feast, then disappear under the soil for the day. Some cutworm eggs overwinter and hatch in spring, but others can hatch at any time after, as long as it is not too cold. Evidently there is one generation per year. The adult moths emerge in late summer and lay eggs which can hatch at varying times of the year. Several species exist: the Army cutworm, Black cutworm, Variegated cutworm, and a new species here in Oregon, which is active year round, the Winter cutworm. The first picture above shows a cutworm that appeared on heirloom petunia seedlings while they were on a bench in my greenhouse. 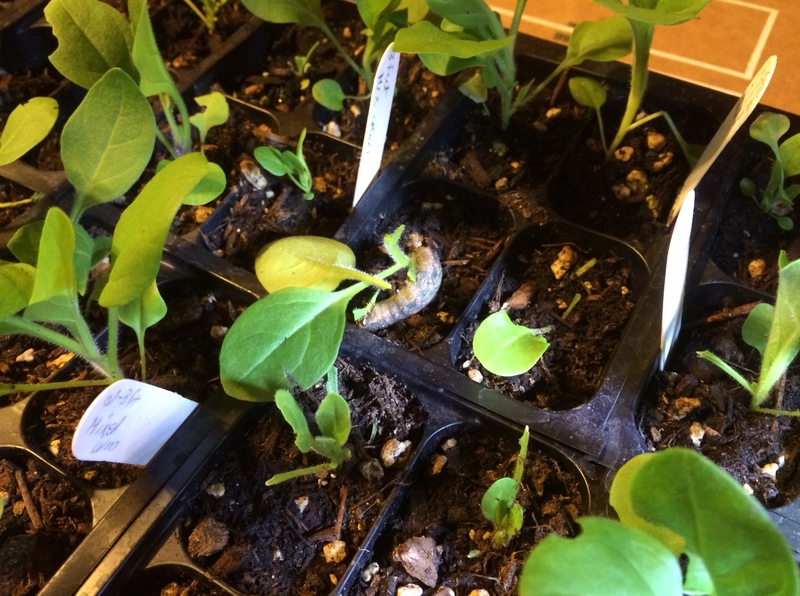 The plants had been transplanted two weeks before, so I was surprised that the cutworm was able to climb so far! the photo was taken in May, so this was probably the variegated cutworm, which we have spring, summer and fall. 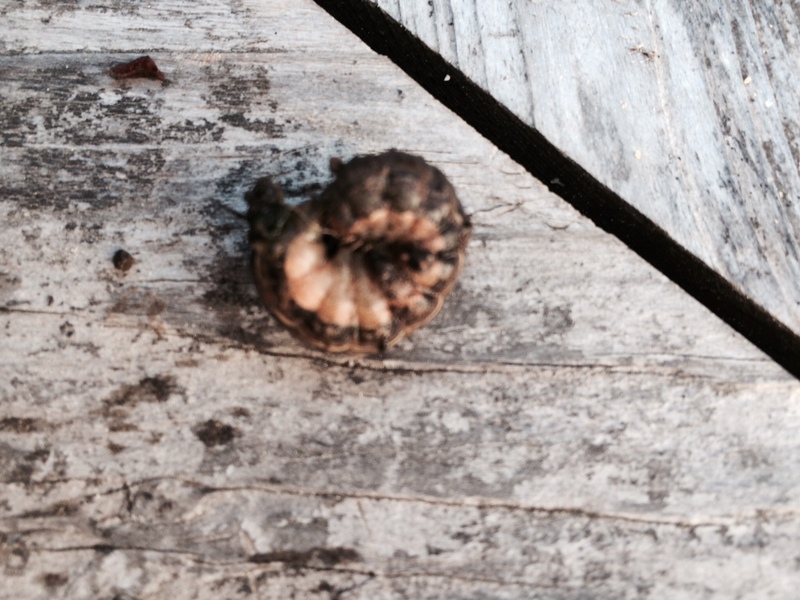 The second picture shows another cutworm on the edge of a patio planter, three feet above the ground. The other three photos reveal damage on in-ground plants made by Winter cutworms in December, January and February. 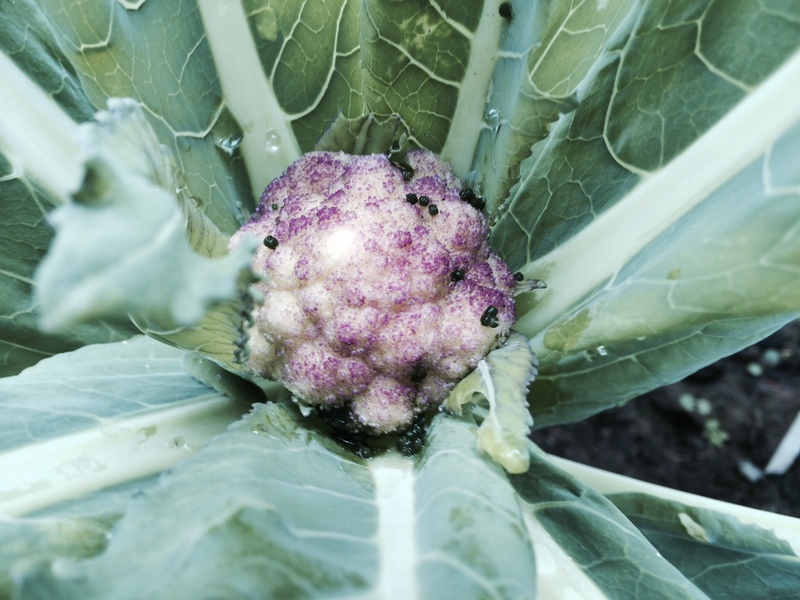 Cutworms typically leave black droppings on your plants; the photo of the cauliflower shows this. An organic gardener’s best first defense against cutworms is prevention. A week before plants are to be set out, prepare your bed by cultivating heavily to dislodge and destroy any worms in the soil, then cultivate again. When you plant your transplants, place collars around the plants to make it difficult for the worms to get to your plants. Collars may be made of paper (milk cartons work well), plastic, metal or cardboard. Here it rains so frequently that I choose to use plastic milk jugs or cans with the bottoms cut out of them. After planting, spread one or more of the following sharp-edged deterrent mulches over the soil, around the plants: diatomaceous earth, eggshells, wood ashes or sharp grit. The rough surfaces of any of these will discourage cutworms from crawling to your plants. Another preventive method is to wait until two hours after dark, take a flashlight, search out the larvae and use the squish-bug technique for control. Continue to cultivate around your plants to dislodge hiding larvae. One other way to fight the battle is to attract or purchase beneficial insects to control cutworms. Ground beetles, parasitic nematodes and tachinid flies attack cutworms. Pollen-laden flowers, (don’t forget about native wildflowers) will help draw beneficial insects to your garden. A next recourse for severe infestations is to use biological pest controls. The bacteria Bacillus thuringensis kurstaki (known as BTK) made into a liquid spray is effective in controlling cutworms as long as you do not have continuous rain, as we often do here in western Oregon. 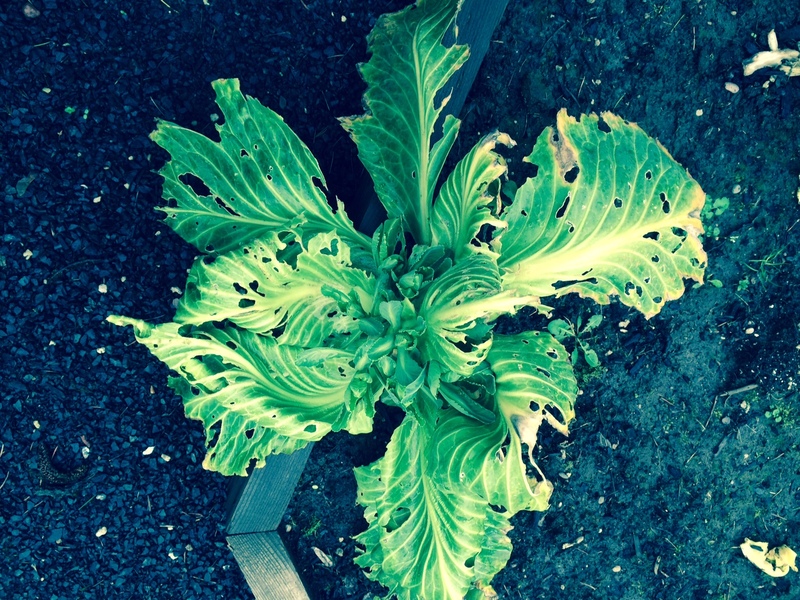 The damaged cauliflower, cabbage and primrose in the photos above show the effects of cutworms in winter, during a three month-long period of rain. Dry BTK can be mixed with moistened bran to act as a bait and will last a few days until washed away. Of course one can use the handpick squishbug method, but it might be difficult to keep up! BTK cannot be used over and over without enabling cutworms to develop resistance. Take care not to spray anything other than the very plants you need to protect when the larvae of butterflies are present. Organically approved pesticides containing pyrethrin may also be used for heavy infestations. We have to face the fact that here in much of the Northwest we have a short frost-free growing season. Those living at higher elevations have an even shorter growing period. Most gardeners in the area look for ways to extend the vegetable growing season: everyone wants to have ripe eggplants, tomatoes, squash, melons, etc. before the season ends and frosts return. A great help for gardeners is to purchase or construct covers, or cloches, to protect our plants early and late. In the nineteenth century, glass bell-shaped cloches were used, as well as cold frames glazed with glass. Today, one popular and inexpensive alternative cover is a polyethelyne tunnel, a series of metal hoops over which plastic is stretched. The spring vegetable season can be started up to four weeks earlier with tunnels. The same is true of fall, when it is possible to have crops ready up to six weeks later, because the soil will be warmer in fall and hold its heat longer if cloched. Tunnels are quite useful for heat-loving crops in our frequently cool summers; cantaloupe, watermelons, squash, tomatoes, eggplant, and cucumbers are some examples. Floating row covers will also protect plants at night from colder temperatures. The heaviest will protect plants from frost up to seven or eight degrees of frost. Plastic jugs, with the caps taken off and bottoms cut out, work well for small plants planted out before late frosts occur. Covers can be placed before nightfall and removed during the day. Gluttonous and ubiquitous cutworms will be discouraged from chewing by the subterranean sharp edges of the jugs; this is important because these creatures feed at night. Large metal cans and paper milk jugs are other inexpensive cloches. Cold frames are excellent cloches or protectors of young plants. The soil inside them stays much warmer at night than the outside air. If mats or fabric floating row covers are used to cover plants they will protect crops to lower temperatures than uncovered plastic tunnels or jugs. I constructed my own cold frames, though they can be purchased from many sources at a considerable price! An important factor with cold frames is to open them in the morning as soon as temperatures permit and close them before it gets too cold, in late afternoon or early evening. Paper, glass, water-filled plastic covers or wax coated cloches are other quick solutions to save plants if a late frost is expected. In Montana, in a mountain valley at an altitude of 3,000 feet I have used cloches to save bleeding hearts, primroses, lilies and early spring flowers from sudden freezes that would have set them back considerably.